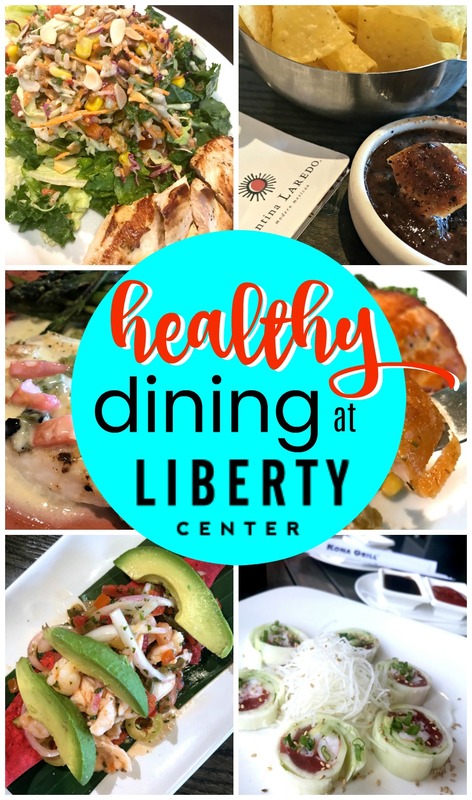 Healthy Dining Options at Liberty Center | The Food Hussy! Summer feels like it's here - but it actually doesn't start for almost a month! But with the hotter temps also comes less clothing (#summerbodies) - so let's see what kind of HEALTHY food finds we can dig up at Liberty Center! With a beautiful courtyard and tons of outdoor patio options - Liberty Center is a great place to shop or grab a bite to eat. So I went on a quest and found some really healthy options around the mall! First up - Kona Grill! They have the garage doors that open up to the outside and it's so nice - you're in the shade but you still get the fresh air! I chose the Poke Naruto Roll with Tuna (240 calories) - it was super light and crunchy with the cucumber wrapper. (avocado, red onion, shrimp, cucumber wrapper, sriracha, green onion, sesame seeds, sweet sesame sauce, tuna). I loved it and since hubby doesn't love sushi and it was so light - I might have eaten the whole thing. That's the nice thing about sushi - there are a lot of really healthy options - so get a few rolls and share. Just avoid the ones with the mayo/aioli sauces if you're trying to be healthy. Kona Grill --- located across from movie theater --- Menu --- Nutrition Info --- 7524 Gibson St. I adore Mexican food - it's probably my favorite of all ethnic foods but finding something fairly healthy isn't always easy. There's just so much cheese...and cheese...and oh CHEESE! We started out with Ceviche (890 calories) - which isn't too bad - especially if you're sharing it amongst friends. If you want to go lower cal - skip the chips. There are some calories in avocado and olives - but those are the "good fats"! A lighter option from the appetizer menu would be the Ahi Tuna Tacos (350 calories). The chef prepared us their orange roughy with a beurre blanc sauce (approx 720 calories) with a side of cilantro rice and asparagus (165 calories combined). This was AMAZING!!! The orange roughy is so light but yet meaty - it's a thick fish and was seasoned perfectly! The sauce - I made them double check because I thought it was queso - but thankfully it was a much lighter beurre blanc sauce but it had so much flavor and but without the heaviness! I saved half for my lunch the next day and everybody at work was super jealous because it tasted soooo good! Cantina Laredo --- located next to hotel --- Menu --- Nutrition Info --- 7125 Fountainview Dr. Yes - I'll admit - I'm a bit of a Rusty Bucket addict - so while they don't have their nutritional info on their site - I emailed my contacts and asked them about their healthy options and they invited me into try a couple of them. They started me off with their Citrus Roasted Salmon which was DECADENT! It was prepared to a perfect medium rare and served with a side of broccoli, quinoa and farro salad with a citrus vinaigrette. I got two bites of this before my husband inhaled it! He even ate that salad without asking me what was in it (that NEVER happens)! The other recommendation was their Harvest Salad with roasted chicken, kale, cranberries, sweet corn, quinoa, farro, grape tomatoes, peppers, toasted almonds & pecans, fresh herbs and a sherry mustard vinaigrette. They actually use the same side from the salmon in this! It was delicious and one of those complex salads with everything including the kitchen sink thrown in and so many healthy foods. Rusty Bucket --- next to movie theater --- Menu --- 7524 Bales St.
Bibibop is another of the "fast casual" Chipotle-style restaurants that have come up in recent years. It's very quick - you stand in line and put your order together as you walk through the line. There are tons of healthy options and it gives you the flexibility to make it more of an Asian dish or more of a Mexican dish. You choose your base (purple rice, white rice, noodles, salad, roll) and then add hot toppings (potatoes, black beans, bean sprouts), protein (chicken, spicy chicken, steak, tofu), cold toppings (daikon, cucumber, carrot, kale, lettuce, corn, cheese, eggs), sauces (cucumber wasabi, sesame ginger, korean red, yum yum, teriyaki) and sides (kimchi, pineapple). Bibibop --- located on frontage road down --- Menu --- Nutrition Info --- 7616 Blake St. Cheesecake Factory --- located on frontage rd --- Menu --- 7612 Blake St. While Bibibop is quick - there are times when you're food courting it - right?! And even then - you want healthy options! 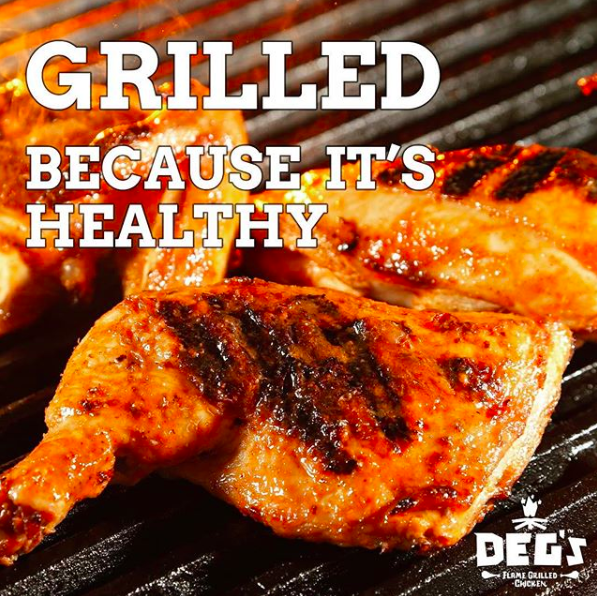 Deg's Flame Grilled Chicken is the perfect spot for that. You can get a two piece meal for under 400 calories. So there you go - healthy dining options all around Liberty Center! I loved hanging out at Liberty Center to uncover all of these delicious and nutritious finds!